Dr. Kristen Denslow will direct “A Comedy of Errors” in Wharton Auditorium on April 11, 12 and 14. For many years, the English department at Southwestern Adventist University has reenacted various famous literary works and produced them for the enjoyment of the university’s campus. Starting with You’re a Good Man, Charlie Brown! in 1979, the department has made it a mission to maintain the campus-wide tradition. This year will be no different. In April, the English department will be producing another one of their famous reenactments. The play is based on Shakespeare’s “Comedy of Errors,” and is directed by English professor Dr. Kristen Denslow. Initially set in the city of Ephesus during the 16th Century, “The Comedy of Errors” is a comedy about mistaken identity, loss, reunion, and reconciliation. The play features two sets of twins, separated by shipwreck as infants, who more than 20 years later end up finding each other in the same town on the same day. It is fast-paced and hilarious with a powerful underlying story of family reunion. Retaining the traditional Shakespearean language, Denslow is hoping to make the play more relatable by placing it in a modern 1960’s Miami setting. 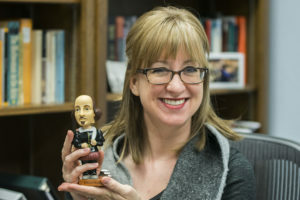 Keeping it in line with Southwestern tradition, Denslow hopes to convey her personal love and fascination of Shakespeare’s works through the contemporary setting. “It brings something new to the text. And I think it’s fun to play around with the built environment of the stage,” she says. The play will be performed in Wharton Auditorium on Thursday, April 11 at 7 p.m., Friday, April 12 at 4 p.m., and Sunday, April 14 at 2 p.m., and 7 p.m.